I’m a big fan of gimmicks that actually make sense and offer a bit of fun and the soon to launch WeatherOnSale.com is definitely catchy and fun. 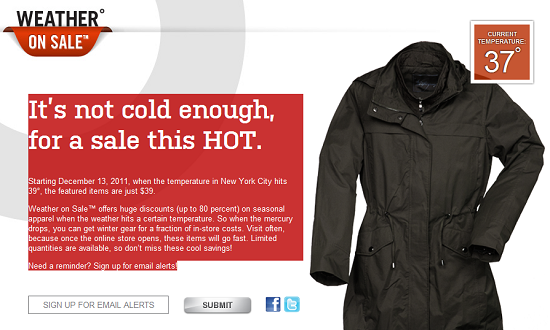 Using the tag line “It’s not cold enough for a sale this HOT” the site which launches on December 13, 2011 offerings sales on various items but only when the temperature in New York City hits 39° or lower. Once that temperature is reached items on the site are sold for $39. According to the website discounts will reach up to 80 percent off seasonal apparel and will be based on season temperatures which means it will change in the warming months compared to the colder months. Unfortunately limited supplies are available which means you’ll want to keep a close eye on the thermometer to ensure you grab the sale before other people. Do you like the idea behind WeatherOnSale.com?